Blue Moon Ranch beef is grass-fed because we feel raising our animals on pasture, produces the best quality beef for our family and customers with the least environmental impact. 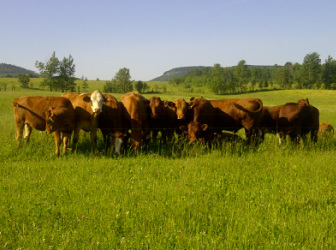 The cattle are rotated through our 90 acres of pasture to ensure they are always getting the best quality grass. Grass-fed beef is known to have drastically higher levels of: Vitamins A & E, conjugated linoleic acid (CLA), omega-3 fatty acids, beta-carotene and lower levels of calories, total fat and saturated fat; compared with its conventionally raised counterparts. Grass-fed beef has a reduced environmental footprint compared with traditional feedlot beef. Often, the cattle graze on land that would be hard to farm traditionally (too hilly or rocky to plant). Additionally, raising beef on pasture consumes much less fossil fuel, because we aren't harvesting the feed and bringing it to the cattle, but rather they are grazing and spreading the fertilizer (manure) themselves. Because they are raised on pasture in their natural environment, grass-fed cattle have a better life than animals raised in a feedlot. As Joel Salatin likes to say "we give our animals a good life so they can become our good food". Grass-fed beef is said to have a more "beefy" taste than its grain fed counterparts. Because it is leaner than traditional beef, it's important to not overcook it. 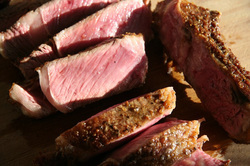 Count on at least 30% less cooking time and only cook to rare or medium rare (145-155F). You can use any cooking technique you like: barbeque, frying pan, broiler, or pot roast, as long as you keep an eye on the cooking time. Watch for our recipe page (currently under construction).